Sublime music rose from the valley that in biblical times was filled with the cries of children sacrificed to the Moloch. Stefano Secco wows the audience; sopranos and tenors get the best roles. The late-afternoon sun had set the walls of Jerusalem’s Old City aglow, and as I walked down toward Sultan’s Pool the sounds of opera rose from the Hinnom Valley. 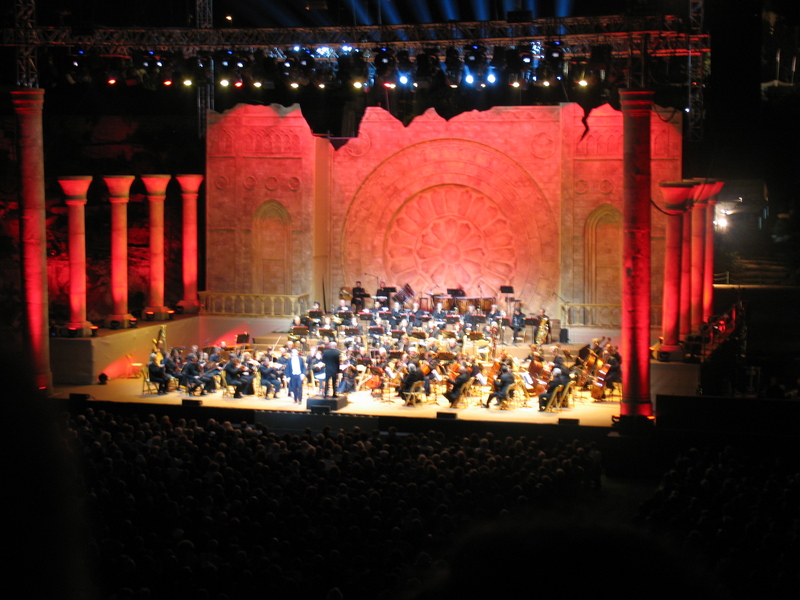 The gala concert of arias that was to kick off the Opera in Jerusalem festival—an extension of the Opera at Masada festival—had not yet begun, but recorded music filled the valley, and I was already enchanted by the setting. The concert began with a super-spirited rendition of the overture to Rossini’s opera William Tell. Never did the Lone Ranger gallop as quickly and vigorously into the sunset as did the Arena di Verona Orchestra, under the baton of Giuliano Carella. This is the official orchestra of Verona’s annual opera festival and it has had a succession of famous conductors, including Zubin Mehta and Lorin Maazel. All four soloists from the Arena di Verona opera, including bass Luiz-Ottavio Faria, were impeccable, but the greatest crowd pleasers were Svetla Vassileva, a svelte soprano (they don’t build divas like they used to), and tenor Stefano Secco. Sopranos and tenors seem to get the best parts in operas, but it was their voices that wowed the audience. Mezzosoprano Mariana Pentcheva put some pizzazz into her role as Mistress Quickly in a duet from Verdi’s Falstaff Reverenza!, and the audience responded with appreciative applause. 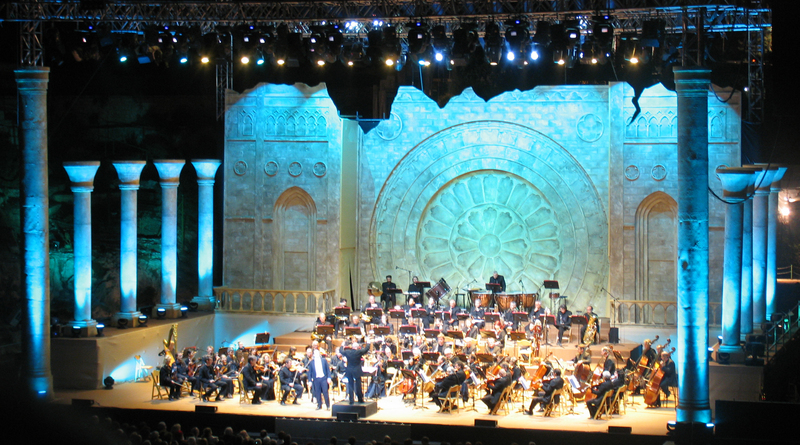 The Jerusalem events are to include 30 concerts in various venues, including churches and the Tower of David Museum. The highlights are Verdi’s Requiem and his rarely performed opera Jerusalem, both at Sultan’s Pool. Jerusalem mayor Nir Barkat is justifiably proud of helping to bring these world-class performances to Jerusalem, but his efforts were almost derailed at the last moment by National-Religious and ultra-Orthodox deputy mayors who wanted the city to withdraw its support because the concerts would bring Jewish audiences into churches and some events would be held on the Sabbath—as if either of these factors was a novelty in the city. Fortunately, the forces of darkness were defeated and the show went on as scheduled, even with a greeting from the mayor. The warm afternoon turned into a windy, chilly Jerusalem night and as the audience drifted in (the concert began half an hour late) vendors did a brisk business in scarves. Still, many people were uncomfortably chilly (some even left during the intermission because of the cold) and I shivered for soprano Vassileva who came onstage bare-shouldered. The columns and huge rosette of the stage set evoked ancient ruins, colored by turns red, blue, purple, pink, and yellow. But they could hardly compete with the real setting: David’s Tower, Mount Zion and the Old City walls on the east, and the 19th century buildings and windmill of Yemin Moshe on the west. It’s an incredible and almost ideal location. There was a little humor in it too. The announcers in French and German seemed to think that the Ottoman sultans who built Sultan’s Pool used to cavort in it; amusingly, they referred to it as piscine and Schwimmbad. Actually, it was a giant reservoir for rainfall trapped by a dam across the Hinnom Valley, and it once supplied Jerusalem with water. Long before that, the valley was the site where children were sacrificed to the Moloch, and the name Hinnom is said to be linked to the cries of these martyred innocents. Between 1949 and 1967 the valley was no-man’s land between Israel and Jordan. And since 1967 the pool has been a venue for summer concerts, though never for opera, until now. Today, busy roads run along the east and south sides of the pool, and the musicians and audience had to contend with the blare of horns and the squeal of brakes. But the traffic grew quieter as the evening progressed, and the wonderful music and the beautiful setting made the distractions fade to insignificance. When the concert ended in a lively quartet from Verdi’s Rigoletto, the musicians received a standing ovation. It was a fitting conclusion to a week of ceremonies marking the fiction of a united Jerusalem. Though the city that pretends to be united is still divided, at least the valley that separates the two parts was filled with the sound of sublime music. Text and photos copyright 2011 by Esther Hecht. No part of the text or photos may be used without written permission of the author. This entry was posted on June 4, 2011 at 5:44 am and is filed under travel, Uncategorized. You can follow any responses to this entry through the RSS 2.0 feed. You can leave a response, or trackback from your own site. So interesting – could you tell whether there was a mixed audience from all sections of the city? “…Never did the Lone Ranger gallop as quickly and vigorously..” made me smile, and imagining “Hi-ho, Silver! Away!” in the valley is a good antidote to the idea that the opera might have been banned. I don’t know whether people came from all sections of town, but there were plenty of men with kippot (yarmulkas) and I know that some people came from out of town. I recall that when we went to a musical evening at the Mormon Center about five years ago that there were Palestinian families there. Or at least they were Muslims – though they could have been Israeli Arabs – we talked with them and one of their children was a competitor in the competition we were watching. I was wondering therefore what kind of ethnic spread there was at the Opera. I did not see anyone dressed in modest Muslim attire, but I wasn’t watching the audience that closely. Beautiful description of the opera and the locale, and I appreciated learning the history of the place that you put in too. Wish I had been there, it sounds like it was gorgeous! Thanks very much, Tamara, for your comments.